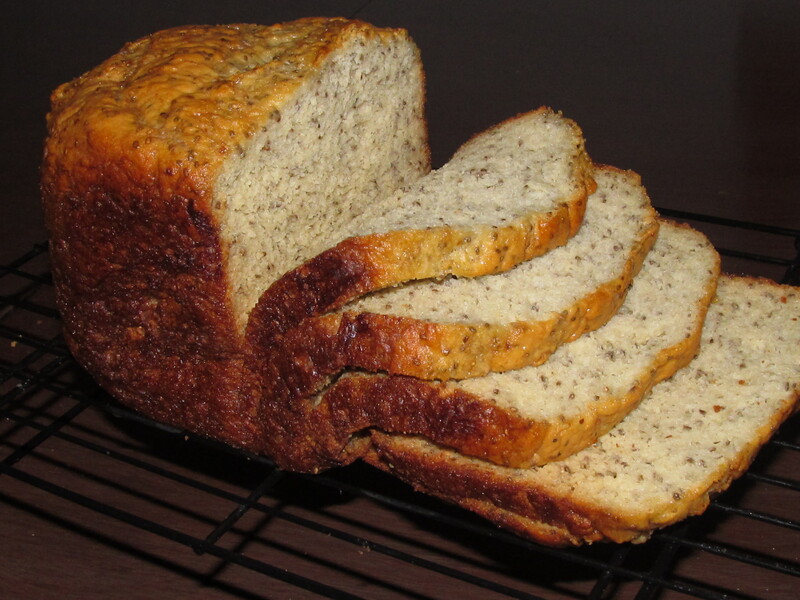 For the bread in the photo above, I used the variations in the recipe below, and added seeds to this loaf. Note: If you use another flour that does not have xanthan gum, then you must add it. If you have a Bread Machine with a GF setting, then mix in Yeast Mixture below and pour all ingredients into Bread Machine set to GF, scrap down sides and bake. If you do not have a GF setting, then follow instructions below. Making sure you have the kneading blade inserted in the bottom of your baking pan, and start adding the wet ingredients. Add eggs, butter, applesauce, and molasses. Place pan into bread machine and start the mixing cycle, setting it for 20 minutes. In medium size mixing bowl whisk together, all dry ingredients and add to wet ingredients, carefully dipping flour mixture into bread pan while it is still mixing. Using a rubber spatula scrape sides down after adding flour, making sure all ingredients are getting mixed and there is no flour build up on sides or in the bottom. In medium glass mixing bowl, add sugar, butter milk, & water. Stir to dissolve sugar. Add yeast and whip briskly with plastic whisk until yeast mixture starts to foam. Then pour yeast mixture over dough while paddle is still stirring. Use rubber spatula to help incorporate yeast mixture. Make sure sides are scraped down of any loose flour. After the dough rises, turn the machine to the bake cycle for 1 hour. At the end of the baking time, check to make sure it’s done by inserting a wooden toothpick in the center, if it comes back clean, then bread is done. Remove pan from machine and remove bread by inverting loaf onto cooling rack. I like to butter the entire loaf with melted butter. Let bread cool for at least an hour before slicing. Enjoy!! After bread cools and is sliced, store in an airtight container. It is always better if GF bread is warmed slightly or toasted before serving. Variations: To change this loaf of bread up, I like to add seeds. To make it a seeded loaf just add 1/4 to 1/2 cup of your favorites seeds. Sunflower, flax, sesame, or any seed you prefer. Instead of the molasses or honey, you can also add agave nectar, in the same amounts. I have also found that apple sauce or apple puree, or even fresh grated apple substantially improves the texture of gluten free bakes, be it bread or cake. Great texture throughout the whole loaf! Yes it does. I like to use fruit instead of so much butter or oil. What size bread loaf should the bread machine say? We have done 2 different bread settings. We did a1- 1/2 loaf and a 2 loaf setting. My bread machine makes a 1 1/2 pound and a 2pound loaf.The Brown Bread recipe should make a 2 pound loaf. IT’s the 15th – the day that your book should be in our bookstore. You’re welcome, Irene! And Thank you for the congrats! Which book store, or what area are you in? My book came out the 9th of July here. Just wondering why it is so late getting to you.